Has energy storage reached a tipping point? With growth rates and cost declines that rival solar, energy storage for the grid and EVs is poised to disrupt many markets. Deutsche Bank caused a stir earlier this month when it suggested that energy storage technologies – specifically, lithium-ion batteries – are likely to become cheap enough within five years to deploy on a massive scale. “We believe 20 to 30 per cent yearly cost reduction is likely,” according to a report from the bank, which was released March 2 to its customers. That pace of cost reduction, it said, creates “mass adoption potential before 2020” – starting with utility and commercial use. If the forecast proves correct, the impact will be huge. The lack of affordable, reliable and long-lasting energy storage has, in many ways, been the Achilles heel of renewable energy and electric vehicles. Naysayers of both point to the high cost of existing energy storage technologies as a big reason why intermittent sources of clean power, such as wind and solar, will never replace fossil fuels; and why electric cars will never be a serious challenge to today’s increasingly efficient gas guzzlers. But such a shortsighted, “moment-in-time” perspective ignores developments that have taken place over the past few years. It also neglects to accept that similar developments will most certainly occur in the years ahead. We’re not even through the first quarter of 2015 and there’s already reason to believe that energy storage is close to reaching a tipping point, if it hasn’t already. In the same way advances in energy storage made mobile devices like the iPhone ubiquitous, further advances will make EVs just as affordable and reliable as gas-powered cars and give solar and wind their long-awaited edge over coal. The U.S. alone is expected to deploy 220 megawatts of energy storage this year, more than tripling 2014 figures, according to a recent report from GTM Research and the U.S. Energy Storage Association. Since 2013, energy storage capacity has expanded five-fold. By 2019, it’s expected to reach 861 megawatts – roughly 11 times its size in 2014. “Attractive economics already exist across a broad array of applications, and system costs are in rapid decline,” said Shayle Kann, senior vice-president at GTM Research. The takeaway message: energy storage over the next five years is expected to enjoy roughly the same spectacular rate of growth as solar PV did between 2009 and 2014 – a compound annual growth rate of nearly 70 per cent. Already, larger players in the solar market are jockeying for position, anticipating that solar in combination with energy storage is going to become an increasingly larger portion of their business. 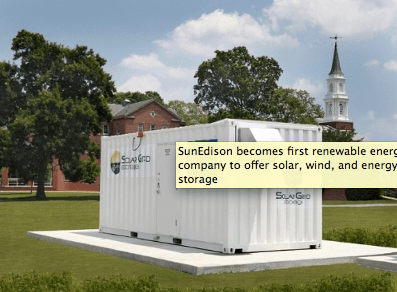 Earlier this month, for example, SunEdison acquired Solar Grid Storage as part of a plan to integrate energy storage into the wind and solar deals it strikes with businesses, municipalities and utilities. SunEdison is the world’s largest renewable energy development company, so its decisive move into storage is a telling sign of where the industry is going. And it’s not the only one making that move. Ever hear of this guy named Elon Musk? Well, not only is he chief executive of Tesla Motors, he’s also the chairman of SunEdison rival SolarCity. In February, Musk told analysts on a conference call that the company will start producing a home battery product within the next six months. Last September, Musk revealed that his energy storage dreams weren’t just based on Tesla’s electric cars. At an event co-hosted with his cousin Lyndon Rive, CEO of SolarCity, Musk said that within five to 10 years every solar PV system installed by SolarCity will be combined with energy storage. Most of those batteries will come from Tesla’s planned Gigafactory, a massive lithium-ion battery manufacturing plant the company is building in Nevada. The solar-powered factory is expected to start churning out product in 2017, and by 2020 is expected to produce enough battery packs to power 500,000 Tesla vehicles per year. Utilities, especially those that rely heavily on coal, should be concerned – if not terrified. Indeed, Morgan Stanley estimated that the number of Tesla vehicles driving U.S. roads by 2028 would have a combined energy storage capacity of 237 gigawatts – roughly equal to 22 per cent of U.S. power production capacity. That figure, of course, excludes all the other plug-in vehicles (PEVs) driving around. Imagine if we could harness all of that mobile storage to manage the grid and support the growing use of solar and wind energy? By 2024, we won’t have to imagine. Energy consultancy Navigant Research estimates that within the next 10 years emerging vehicle-to-grid services could deliver up to 4.2 gigawatts of energy storage to the grid. With the market for PEVs surpassing 320,000 globally in 2014, vehicle-to-grid pilot projects are already emerging with greater frequency, Navigant said. This potential is above and beyond what we’re seeing with stationary storage – the market that SunEdison and SolarCity is going after, and which some of the more progressive utilities out there are taking seriously. It also excludes other forms of energy storage that are coming to market, such as flywheels and thermal storage, as well as the possibility that another, better battery chemistry will disrupt the market further. Just last week, Dyson, the company known for its bagless vacuum cleaners, invested $15 million in a battery startup called Sakti3, which was spun out of the University of Michigan and counts General Motors as its first strategic investor. Sakti3 has developed a solid-state lithium battery, meaning the battery’s electrolyte is a solid, not a liquid as in conventional lithium-ion systems. It’s safer and more durable than conventional batteries, and it boasts energy densities that are double what the best lithium-ion batteries can offer today. Translation: Smart phones, laptops and cordless vacuums and power tools that last twice as long but don’t cost more. It also means electric vehicles that can compete head-to-head with gasoline-powered cars on range, performance and refueling time. 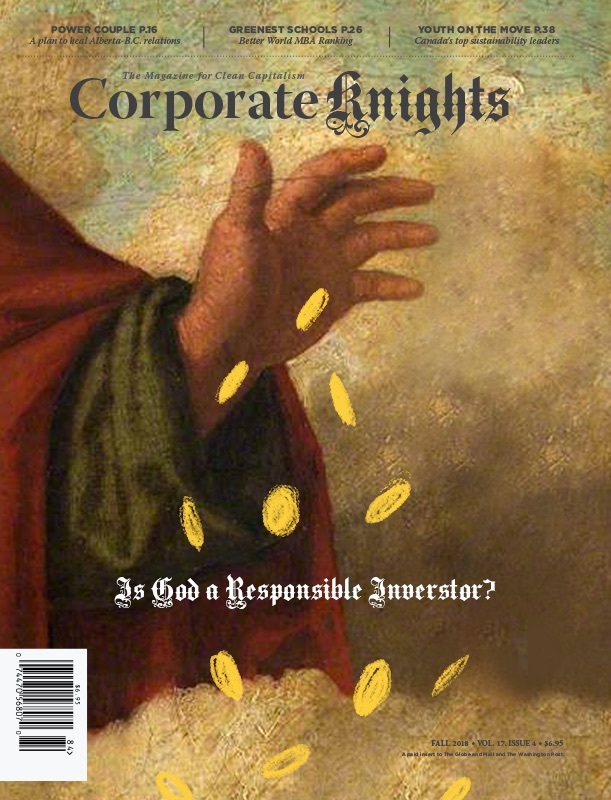 Wall Street Journal writer Christopher Mims, who is also a former Corporate Knights contributor, asked James Dyson whether Sakti3 could one day be worth more than the company he founded. In a press release, Dyson said Sakti3’s technology has “achieved leaps in performance” over existing lithium-ion technology. In other words, in addition to cost-savings through large volume manufacturing, such as what Tesla is attempting, improvement in storage capacity and cost will also come from the kind of technological advances Sakti3 – and many others – represent. Investors in fossil-fuel companies may want to keep a close eye on this trend. History has demonstrated our tendency to underestimate the potential of renewable energy technologies the same way we underestimated the potential of mobile phones and other technologies that are ubiquitous today and taken for granted. The same story is unfolding for energy storage, what Deutsche Bank calls the “missing link” in our global march to a low-carbon society.